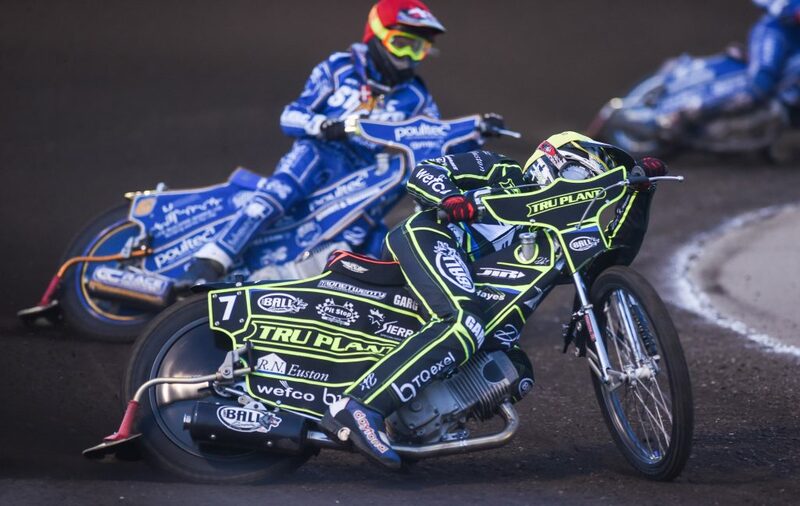 The ‘Tru Plant’ Witches were defeated 52-38 by the King’s Lynn Stars at the Adrian Flux Arena on Monday night in the Premiership Supporters Cup. The Witches started brightly and led going into heat seven. However, the hosts came on strongly in the middle part of proceedings, racking up heat advantages that blew the visitors away and the Witches couldn’t salvage anything from the meeting. Cameron Heeps was the top scorer for Ipswich with 10+1. There was a false start to the meeting as heat one was called back with Stars captain Robert Lambert warned for moving at the start. The hosts dominated the re-run as Lambert won with partner Erik Riss second and as Chris Harris fell on the third lap, he was excluded and the 5-1 was awarded to King’s Lynn. Jake Allen made the gate in heat two and was joined early on by Heeps. However, Michael Palm Toft managed to split the Witches pair, passing Heeps for second at the start of the second lap, meaning a 4-2 to the away side. Krystian Pieszczek won heat three and was joined by Richard Lawson on the opening lap at the front for a 5-1 to the Witches that gave them a 10-8 lead early on. The home side levelled things in heat four with a 4-2 as Thomas Jorgensen won from the gate ahead of Allen and Palm Toft passed Danny King for third as the Witches skipper lifted coming out of the second bend on the second lap. Ty Proctor won heat five with Harris in second, but David Bellego couldn’t get amongst the points with Lewis Kerr third, meaning the home side were back in front on the night with a 4-2. Heat six was called back with King warned for moving at the start. King made no mistake in the re-run as he took the win and he was joined by Heeps who passed Stars captain Lambert on the back straight of third lap to complete a 5-1 that gave the Witches a 19-17 lead. The lead was short lived though as Palm Toft and Jorgensen recorded a 5-1 for the home side in heat seven. The home side made a switch at reserve for heat eight bringing in Palm Toft for Kasper Andersen and it paid off as Palm Toft won and was joined by Riss for another maximum to the hosts. Kerr won heat nine but Heeps and King were both in the points for a 3-3 that gave King’s Lynn a 30-24 lead. The hosts extended their lead in heat 10 with another 5-1 thanks to Riss and Lambert, leaving the Witches with a lot of work to do with five heats to go. Heeps came in for Bellego in heat 11 and the Australian led the heat but was passed by Jorgensen on the third lap as it ended in a 3-3. Lambert won heat 12 ahead of King as Kerr picked up a point for a Stars 4-2 that put them in a commanding position, 42-30 up with three to race. Heeps replaced the battered and bruised Harris in heat 13 and Allen came in for Pieszczek, but Jorgensen was unbeatable on the night and won again as Allen managed to muscle into second to limit the hosts to a 4-2 with Proctor third. The Stars had confirmed victory going into heat 14 as the Witches fans decided to vote in King & Heeps via the Twitter poll. Kerr and Palm Toft were voted in for the Norfolk side. Heeps delivered and won the heat taking the chequered flag ahead of Palm Toft as King finished third for a Witches 4-2. Jorgensen finished his night by winning heat 15 to complete his paid maximum with Allen second as Lambert passed Pieszczek for third for a 4-2 to the home side to make the final score 52-38 to King’s Lynn. Heeps has started 2019 in fantastic form and tonight was no different as he proved his worth from reserve again scoring 10+1 as he and Allen kept the Witches competitive throughout. Going into heat 10 the Witches were just six points behind, having led the meeting in the early stages. However, the home side were gathering momentum and the Witches needed to get a positive result in heat 10 to stay in the hunt. Riss and Lambert had other ideas and raced to another 5-1 that put the Witches 10 points down, ultimately leaving them too much to do. The Stars pick up three Premiership Supporters Cup points putting them level on three points with the Witches with both sides having raced twice. Poole and Swindon are yet to open their cup campaigns. The ‘Tru Plant’ Witches host the Belle Vue Aces at Foxhall on Thursday 18th April in a Premiership league fixture.